In this category, the current champions are in favor of one team, the Georgian team, which is the leader in the men's senior category. We think that this time there will be no big changes in this category and most likely the prize places will again be divided by the sportsmen from Georgia - Levani Pogosiani and Alex Pretsuashvili. The category of 60 kg for men is one of the most powerful and competitive categories. Champions in this category change at every international competition. For several years this category has the composition, in which many athletes claim for prizes. In such situation it is difficult to make any assumptions, but we will try - the favorite on the left hand is Vileni Gabrava from Georgia, on the right hand – Roman Tserekaev from Russia. Ashot Adamyan, in our opinion, is a contender for victory on both hands. This is all subject to a similar composition with the sample in 2016. But last year a legendary sportsman, Dmitry Beskorovainy from Ukraine, returned to the performances. 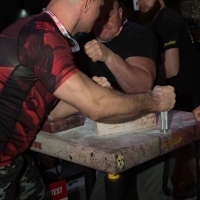 At the national championship Dmitry became the absolute champion in the category of up to 60 kg. If Dmitry decides to pull at the European Championships, it will be very interesting, because behind him is a huge baggage of experience. We do not undertake to predict his result, but if it is in the application, everyone will have to be nervous. Jambul Vibliani, due to his incredible strength and vast experience, dominates in his weight category. Last year, in this category at the European Championships, he took two gold, and at the World Championship – one, losing to the right hand the young sportsman from Azerbaijan - Gismat Vakilov. But, unfortunately, after the World Cup, the doping test of Gismat gave a positive result, so we will not see him this time. It is also worth mentioning that Oleg Cherkasov from Russia, who is as strong as Jambul, missed the 2016 competitive year. If Oleg will pull this time, then he and Jambul are the main favorites to win on both hands, and their chances are approximately equal.